Almost half of the Government’s development projects and programs managed under 47 line ministries have not reached at least 50% of quarter one targets, the Finance Ministry reported to Cabinet this week. 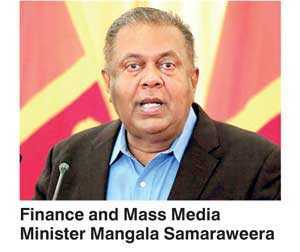 Presenting the report on Government expenditure of quarter 1 of the fiscal year, Finance and Mass Media Minister Mangala Samaraweera told Cabinet that financial progress of projects has been recorded as 43.7% against the targeted expenditure for the period. The Government has allocated a total of Rs. 700,686 million for 1,354 projects and programs to be implemented through the line ministries, however four ministries – Development Assignments, Special Assignments, Public Enterprise Development and Foreign Employment – have not identified such programs for implementation in 2018. Out of the total allocation 84% amounting to Rs. 589,159 million has been allocated to 1,271 projects through annual budgets estimates while the balance has financed 83 projects through different implementing agencies from their revenues and direct loans. Recording a total Government expenditure of Rs. 403 billion during the period, the report also notes that 444 have not achieved at least 25% of the first quarter agreed physical target. Out of these, 148 large-scale projects have only recorded 35% of the target for the period. Only six line ministries have been able to achieve at least 75% of the quarterly expenditure target in at least three-fourth of projects implemented by the institutions. Further 12 line ministries have not been able to achieve at least 25% of their expenditure targets set for 75% of the projects implemented by themselves. According to the Minister, the reasons given by ministry officials for the low performance rate include delay in preparatory works and procurement works, procurement issues, poor performance and cash flow issues of contractors, outstanding bills, delay in impress sent and delays in third party approvals and delays in land acquisition problems. However, Samaraweera has noted that the Government has been able to meet 90% of the revenue target for the quarter, with a total of Rs. 469 billion, with income tax collection estimate reaching 105% of the target. Further the Government has achieved targets in collecting Pay As You Earn (PAYE) and Economic Service Charge (ESC) while 89.9% target has been achieved in tax on interest collection. Only Import Duties tax collection has fallen below target to 49.8%.